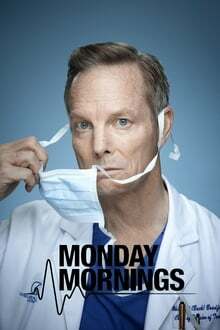 Monday Mornings was an American medical drama television series that ran on TNT from February 4 to April 8, 2013 and aired Mondays after Dallas. It is based on a novel of the same name by Sanjay Gupta. In May 2012, TNT placed a ten-episode order for the series. On May 10, 2013, Monday Mornings was canceled by TNT. Season 1 of Monday Mornings premiered on February 4, 2013. We don't have any reviews for Monday Mornings. We don't have enough data to suggest any TV shows based on Monday Mornings. You can help by rating TV shows you've seen.